The Breagh gas field lies 194ft deep in the Southern North Sea in blocks 42/13a and 42/12a. The Breagh gas field is being developed in two phases. Phase one began producing first gas in Q3 2013. Phase two is under development and planning stage. A normally unmanned installation, Breagh A, was used to develop phase I of the Breagh gas field. The platform was installed in October 2011. The Breagh gas field lies in blocks 42/13a and 42/12a of the Southern North Sea, 65km north-east of the UK. The field lies at a water depth of 194ft. The field was originally operated by RWE Dea (70% interest) until its ownership was transferred to INEOS in 2015. INEOS currently operates the field with a 70% interest, while Sterling Resources owns the remaining 30%. The Breagh field development cost is estimated at approximately £1bn. First gas from the field was achieved in October 2013 with a total flow rate of 2.75 million cubic metres of gas a day. The field currently produces at an annual rate of 1.1 billion cubic metres of gas during phase one, which lasts until 2018. The Breagh field was discovered in July 1997 by discovery well 42/13-2. The well encountered a 121m gas column, demonstrating the presence of hydrocarbons. BP had earlier drilled a well, 42/13-1, in 1968, which was declared commercially non-viable. The Breagh field reservoir is of the Lower Carboniferous age and contains sandstones of the Scremerston Formation. Gas is found in stacked fluvial channel sands in two discrete intervals. The field is estimated to contain nearly 600bcf of recoverable gas reserves. Using data from the 42/13-2 discovery well, appraisal well 42/13-3 was drilled in 2007. The appraisal well flowed at a rate of 17.6mmcf a day, establishing the presence of significant hydrocarbons. Two additional appraisal wells were drilled by the Ensco 70 jack-up rig: one in August 2008 and the other in January 2009. In March 2011, RWE completed the drilling of the 42/13a-6 appraisal well. The well was drilled to a depth of 8,624ft and is being used as a production well. The Breagh field is being developed in two phases. The first phase of development began in 2011. It involved exporting gas through an offshore pipeline connected from new Breach A normally unmanned installation (NUI) platform to Cotham Sands, Redcar. A 10km-long onshore pipeline carries the gas for further processing at Teesside Gas Processing Plant (TGPP) at seal sands to the UK national transmission system. The gas processing facility has a capacity to process 11.3 million cubic metres of natural gas a day. In phase two of development, another nui, Breagh bravo, will be installed on the east end of the field. Additional wells will be drilled from the new platform and tied back to Breagh alpha. Phase two was approved by the UK Department of Energy and Climate Change (DECC) in July 2011. The Breagh A platform was installed in October 2011 at the west side of the field. Eight production wells were drilled using a jack-up drill rig of a similar size to the Ensco 102. The jacket of the platform is 85m-tall, with the topsides weighing 1,400t. The jacket is supported by piles weighing 4,000t. 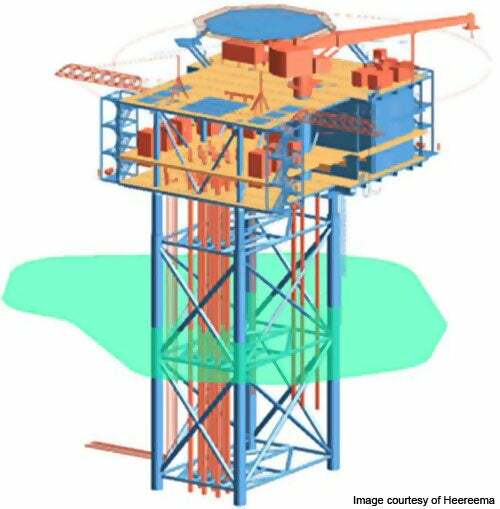 The platform features a 10t diesel crane, a helideck, 12 well slots, a gas production manifold and seven risers. It also features overnight accommodation for 12 people. The subsea production systems for the Breagh field include dry Christmas-trees, production piping, including chokes, and a production manifold. The produced gas and fluids flow from the Christmas-trees through the flow lines to the manifold. From the manifold, gas and fluids pass through the export riser onto the onshore processing facility. A 100km export pipeline was laid at the Breagh field to transport gas and liquids onshore. The 20in pipeline is made of carbon steel API, and was laid at Coatham Sands. A 3in-diameter monoethylene glycol (MEG) pipeline was also laid to provide hydrate and corrosion inhibition. A fibre-optic control cable for communications and control purposes was installed along with the MEG pipeline. From Coatham sands, a new 10km onshore pipeline carries gas and liquids to the TGPP at Seal Sands, Middlesbrough. The plant is owned by Teesside Gas and Liquids Processing (TGLP). A 3in-diameter MEG pipeline and telemetry system were also installed. PPGS carried out a multi-client 2D geostreamer survey of the Breagh field. PX group was awarded the contract for construction and installation of the onshore 20in and 3in pipelines, and the fibre-optic control cable. In November 2010, RWE Dea awarded the engineering, installation and pre-commissioning contract for the offshore pipeline and fibre-optic cable to Allseas. The contract called for detailed design engineering of the export line, MEG pipeline and fibre-optic cable. Allseas deployed its pipelay vessels, Lorelay and Tog Mor, to lay the main and near-shore segment of the pipeline. Heerema Vlissingen delivered the Breagh a platform under an engineering, procurement and construction contract awarded in August 2010. The platform was constructed at Heerema’s Vlissingen yard in the Netherlands. In March 2011, AMEC was awarded a £32m contract by TGLP to modify and extend the gas processing plant for processing the gas and liquids from the field. The Tamar field is a natural gas discovery made by Noble Energy in January 2009 and is the company’s largest find to date. Ruby gas field is located between Kalimantan and Sulawesi Island, 300km south of Balikpapan city in Indonesia.